HOLT Crane & Equipment Celebrates It's 10th Anniversary! The HOLT® name has been around for a long time. Over the past 80 years, HOLT has built a legacy of quality, trust and service in the heavy equipment industry, earning loyal and valued partnerships with its customers. HOLT Crane & Equipment is the authorized Link-Belt crane dealer for Central, North, East and parts of Southwest Texas. In addition, HOLT covers territory in Southern New Mexico. HOLT has facilities in Houston, Dallas and San Antonio, and is also an Isuzu and Mitsubishi engine dealer. 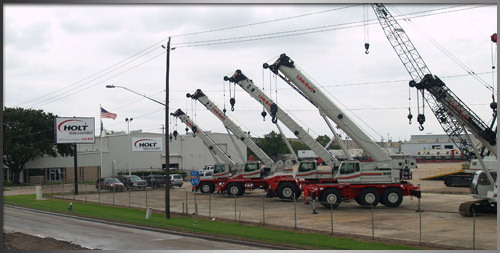 HOLT offers new and used crane sales, service and parts. We are the only dealer to carry genuine Link-Belt parts, as well as Caterpillar, Mitsubishi, and Isuzu engines and parts. HOLT has Link-Belt factory trained technicians with state-of-the-art service trucks, and the latest tooling and test equipment. We offer both shop and field service. HOLT Crane & Equipment offers a variety of other services including: Express Lube Service, Preventative Maintenance, Radiator Repair, Welding-Machining & Fabrication, Hydraulic Service, Undercarriage Service, and Painting.